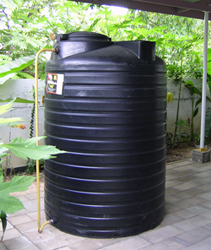 Plastic Water Tanks are excellent for storing water. The fact of being made of plastic makes them very light weight. If your saving on weight, it means lower costs, especially today with the cost of fuel, you are also saving on transport. There are almost no maintenance costs associated with plastic water tanks. Of all the types of plastic out there, polyethylene is the most common, strongest, durable and reliable. That's why polyethylene water tanks should be used to other type of plastic storage tank. They can range from 16 gallons to 15.000 gallons. When using a recycled or new plastic tank, always make sure it's FDA approved. This means that it's suitable for collecting and storing rainwater. They come in all shapes and sizes. They can be horizontal, vertical, rectangular or open top tanks like the rainbarrel. When selecting plastic tanks, make sure it's either black, dark green or some other dark colored so as to block UV rays which in return will grow algae in the tank. If for some reason, it doesn't come in a dark color, you can always use Paint for Plastic This also applies of course for a regular rainbarrel. I am still working on this page.